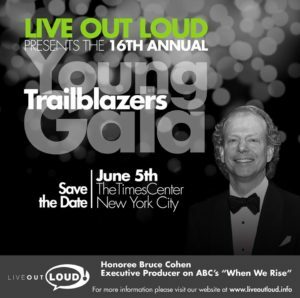 Academy Award-winning producer of film, television and theater, Bruce Cohen will receive Live Out Loud’s Soaring Spirit Award at the 2017 Young Trailblazers Gala! on Monday June 5th. Cohen won the Best Picture Academy Award for producing “American Beauty” (1999) and earned Best Picture nomination for “Milk” (2008). He is the executive producer of “When We Rise,” an 8 hour mini-series on the LGBT rights movement from 1972 to today, created and written by Dustin Lance Black, for broadcast on ABC in 2017. “When We Rise” chronicles the real-life personal and political struggles, set-backs and triumphs of a diverse family of LGBTQ people who helped pioneer one of the last legs of the U.S. equality movement from its turbulent infancy in the 20th century to today. TimesCenter, 242 West 41st Street (Bet. 7th & 8th Avenue), NYC.